August jumps feet first into being August with its first slate of movies that let us know quite well that blockbuster time is over. One decently marketable property is in the mix here from a major studio, but this has a very “forgotten February or October” weekend feel to it. 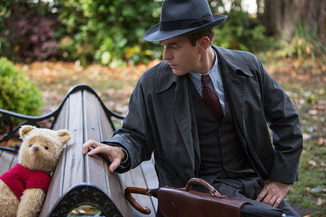 Disney comes out swinging, sort of, with Christopher Robin, another effort to bring its IP into the live action world, albeit with a bit of a twist here. A grown up Christopher Robin, in a boring workaday job and with a young family, is visited by his childhood companions, Winnie-the-Pooh, Tigger, Eeyore, Piglet, etc (yeah, you heard me) who help Teach Him A Valuable Lesson. In a slight twist on these imaginary friend stories, everyone else can actually see Winnie et. al. speak and move as well, which at least removes about 50 percent of my annoyances with the concept. This is a very fictionalized version of Robin as played by Ewan McGregor, who as the son of the author of A.A. Milne was notably resentful of the book series and probably the least likely dude to be receptive to a bunch of cute talking animals that were going to fix his life, but Disney owns this and gets to do what they want with it so OK. Hayley Atwell stars as his wife, with Marc Forster directing, who's covered this kind of magical literary realism before with Finding Neverland. This also shares a little bit of DNA with the Paddington movies, which are an unreserved balm of optimism. That's certainly an appropriate tack for a kid's film, although this one is going for a little broader audience. The moral of “adults need play time too” isn't likely to resonate that well with kids, who will just like seeing live action mayhem with the Pooh characters. Uncharacteristically for Disney, though, it's been held back from reviews, which is the Scarlet Lack of a Letter for films on their release date. For Disney, that's doubly worrying, though in their case it could just mean “it's not as good as we hoped” instead of “it's a stinker”. Still, that's a major weapon they haven't been able to use in the promotion of the film. Overall, it looks inoffensive enough and it has the right branding, but there's enough warning bells here for me to say this underperforms with around $26 million this weekend. Female buddy comedy comes out to play with The Spy Who Dumped Me, starring Mila Kunis and Kate McKinnon as friends to travel to Europe in pursuit of Kunis' ex, only to find themselves in the middle of international intrigue when they discover that he (Justin Theroux) was a spy. Wackiness and hijinks ensue. Surprisingly, this is not from the Paul Feig/Ben Falcone factory of female led action films but comes from first time studio director Susanna Fogel, best known for a two-season TV show about cancer. Good times. Kunis and McKinnon seem like they could have a pretty good chemistry, with McKinnon's high-wire energy playing well against Kunis' straight woman. Reportedly not stingy on the action, it's much more the comedy that's going to be the driving factor in this film's success or lack thereof. Kunis hasn't really done much with a couple of starring roles – Bad Moms was a minor hit but that proved fleeting – while McKinnon remains a comedic whirlwind that no one can really seem to figure out how to utilize. Reviews are middling, which is going to keep it hemmed in – solid critical support can send a film like this into Breakout Land like Spy, or kill it dead like Knight and Day. It doesn't look truly dreadful though, so should manage to come in with around $16 million. Hollywood is still hoping to find the next pearl in the field if YA oysters, this weekend going with The Darkest Minds, the plot of which reads like a parody you'd make of a rather hammer-obvious book. After a cataclysmic event, all of the world's children are either dead or invested with strange, scary powers, leading the governments of the world to fear everyone under 18 and lock them up or otherwise control them. Subtext? The hell you say! Anyway, some children escape and go on the run to build their own society, all while being chased by authorities that don't understand them. Again, I have no idea where you're getting these subtext calls from.